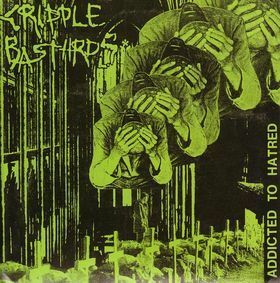 With no doubt one of the most hateful, hysterical works in the whole CB discography. Every track is a deadly stab of antimusical, hyperfast Grind/Thrash running at frantic speed. This is also one of GTB’s fave singles ever. Recorded in Michele’s practice room using the typical diy formula tested and improved through different previous records. ATC’s guitar reaches unbelievable levels of compression and harshness. This Ep has been written in one of the darkest periods of the Bastards’ private lives and fully reflects an asphyxiating sense of anguish + desperate negativity, both musically and lyricswise.The last song is taken from an old rehearsal out of a very short period when CB tried to introduce a drum-machine. More war in Bosnia footage on the front-cover art, an all time obsession for GTB. The word “love” can’t keep its meaning. No, not here. You can’t enucleate my hate. It’s like a tumor during its progressive stages of evolution and actually you can’t find a cell in my body spared by this furious disease. I feel my life slowly die in your arms. you’ll dust it off and you’ll justify,once again,all that you did. you climbed over my dead body to see your horizon,you used me. Like a plastic bottle,only useful until it has been emptied. A cigarette,that you hold in your hand until you see it consumed. I see my initial condition bloom again. Clasped to my frustrations – Stripped from your superfluous life. on which you tried out your “artistic” ability. every kindness hid something miserable,false. Slave to 1000 projects; started … never finished. Day after day,I see my defeat dissolve. for the eyes of all the world that accuses selfish hypocrites like you. Don’t think I’ll ever stop… I want to bend you,squash you,pulverize you. I don’t think of anything but you, your lies. thrashing about in blood,fear and sobs. You’ll never lose me … would be too easy.